Audioquest Cinnamon review | What Hi-Fi? If you're any kind of food appreciative, you'll know that cinnamon adds a sweet, but spicy kick to such delights as mulled wine and apple pie. It's apt then that Audioquest has chosen to name this mid-priced HDMI cable after such a versatile ingredient. Part of a range that includes Chocolate, Coffee and Vodka, the HDMI 1.4 capable and stylish Cinnamon has a dependable feel from the off. We gave our sample a selection of testing scenes and it responded with a will, showing a fluid grasp of motion, minimum picture noise and a fine capability with detail. 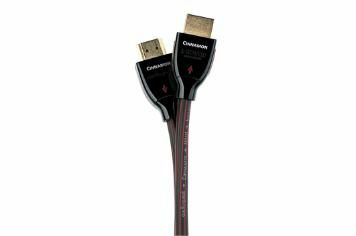 Images are sharp and stable, while this HDMI also offers good sonic ability, with a tonally integrated sound that has the ability to kick tight and hard when required, and yet pull back and display great insight. Head to head with our award winning Wireworld Chroma 6, the Cinnamon pretty much holds its own, although it lacks some of the dynamic suppleness of its close rival, and the colour palette may be too rich for some. On the whole though, this Audioquest is both sweet and spicy with a confidence that will improve just about any system.